The House of Representatives easily passed a measure approving the construction of the controversial Keystone XL oil pipeline, setting up a showdown with President Barack Obama, who has promised to veto the bill. In a 270-152 vote led primarily by Republicans, the House passed the same bill that the Senate itself approved last month. 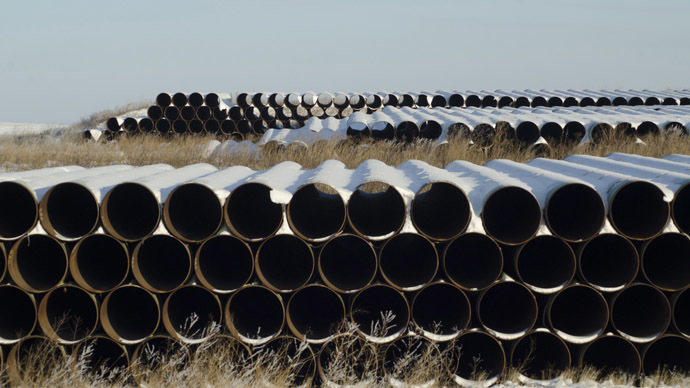 The pipeline was first proposed in 2008 and would carry oil 1,179 miles from Canada’s tar sands to Nebraska, where it would connect to an existing pipeline and continue traveling south. Also included in the bill was an amendment passed by the Senate that acknowledged the existence of climate change, marking the first time many Republicans have gone on record about the issue. A separate amendment stating that humans contribute to climate change, however, was rejected. "We're going to continue to keep our promise to the people by finishing our work on the Keystone pipeline," House Speaker John Boehner (R-Ohio) said Wednesday prior to the vote, as quoted by the Associated Press. Boehner added that President Obama was caving in to "left-fringe extremists" and not listening to the American people. "The president needs to listen to the American people and say 'yes, let's build the Keystone pipeline,'" Boehner said. While the bill easily sailed through the House, President Obama has maintained that he will veto the measure in order to let a federal review of the issue play out. If Obama does veto the measure, neither the House nor the Senate have the votes needed to override his decision. It would be only the third time in his presidency that Obama has vetoed a bill. These reviews were completed recently, though the Environmental Protection Agency commented that the pipeline does pose a pollution and oil spill risk, and could contribute to global warming. The State Department concluded that Canada's tar sands would be developed regardless of the pipeline's construction, making Keystone's contribution to global warming negligible. The EPA recently stated that with current oil prices as low as they are, the State Department should review its initial conclusion. Native American tribes have also spoken out against the pipeline, since it would cut through Native land in Nebraska in order to connect with an existing pipeline. Supporters of the bill have pointed to the economic advantages of the pipeline, noting that construction would add billions of dollars to America's GDP and create thousands of jobs. However, only 35-50 people would be required to maintain the pipeline after it is completed, making opponents question its long-term benefits.